Transactions declined in more than half of all local markets, led by Hamilton-Burlington, Montreal and Edmonton. Although activity did improve modestly in many markets, it was offset by a decline in sales elsewhere by a factor of two. There were 5.3 months of inventory on a national basis at the end of October 2018. While this remains in line with its long-term national average, the number of months of inventory is well above its long-term average in the Prairie provinces and in Newfoundland & Labrador. By contrast, Ontario and Prince Edward Island are the two provinces where the measure remains more than one standard deviation below its long-term average. In other provinces, the number of months of inventory is closer to its long-term average and suggests that sales and inventory are well balanced. By contrast, MLS® HPI benchmark price comparisons are improving on a y-o-y basis among housing markets in the Greater Golden Horseshoe region that are tracked by the index. Home prices were up from year-ago levels in Guelph (+9.3%), Hamilton-Burlington (+6.8%), the Niagara Region (+6.3%), the GTA (+2.6%) and Oakville-Milton (+2.2%). While home prices in Barrie and District remain slightly below year-ago levels (-0.9%), declines there are shrinking; if current price momentum persists, home prices in December are on track to turn positive compared to December 2017. Ottawa, ON October 18th, 2018 – The Canadian Real Estate Association (CREA) recently launched an improved REALTOR.ca website design that features a simpler and more powerful search function, enhanced homebuyer calculators and access to highly anticipated school catchment areas.There are a host of smaller but impactful enhancements to the site navigation, REALTOR® profiles and listing details pages, all with the goal to make it easier for homebuyers to find their dream home and drive more meaningful connections with REALTORS®. The redesign, which targets desktop users, is the second phase of a multi-phase project which delivers an improved and responsive website experience for all visitors.REALTOR.ca, the No. 1 real estate website in Canada, delivers on its promise to facilitate consumers’ real estate needs with access to an average of 300,000 REALTOR® listings at any given time, promoting the value of using a REALTOR® and facilitating connections with REALTORS®. Last year alone, it had more than 264 million visits and generated over 2.6 million leads for REALTORS®. Parents have always asked their REALTORS® about nearby schools when considering a new home. REALTOR.ca now features a tool allowing parents to view properties for sale within a particular school’s catchment area. Buying a home is the largest investment in many consumers’ lives and REALTORS®are here to make the home buying process as simple and informed as possible. Whether searching on the go or at home, REALTOR.ca listings now include improved mortgage, land transfer tax and affordability calculators to support homebuyers in their search. REALTOR.ca now incorporates the Living Room, a REALTOR.ca blog launched earlier this year. The blog features passionate Canadian industry experts tackling a variety of home-related topics including market trends, home improvement, market trends, neighbourhood guides, design files and unique homes. “REALTOR.ca is owned by REALTORS®, and as such, we are committed to continuous enhancements to improve the site to ensure it remains Canadian consumers’ first choice when looking for a new home,” added Ms. Sukkau. REALTOR.ca is operated by The Canadian Real Estate Association (CREA), one of Canada’s largest single-industry trade associations. CREA works on behalf of 125,000 REALTORS® who contribute to the economic and social well-being of communities across Canada. Together they advocate for property owners, buyers and sellers. REALTOR.ca provides trusted, up-to-date and comprehensive property advertisements for residential, commercial and rental properties across Canada. Whether you have just started looking or you are ready to make that important purchase, REALTOR.ca connects you to valuable resources and local REALTORS® to help you find your dream property. Ottawa, ON, October 15, 2018 – Statistics released today by The Canadian Real Estate Association (CREA) show national home sales edged down slightly between August and September 2018. National home sales edged back 0.4% from August to September. Actual (not seasonally adjusted) activity was down by 8.9% from one year ago. The number of newly listed homes rose by 3% from August to September. The MLS® Home Price Index (HPI) was up 2.3% year-over-year (y-o-y) in September. The national average sale price edged up a slight 0.2% y-o-y in September. Sales declined from August to September in slightly more than half of all local markets, led by Vancouver Island and Edmonton, along with several markets in Ontario’s Greater Golden Horseshoe (GGH) Region. Activity declines in these markets were offset by monthly gains in the Fraser Valley and Montreal. Actual (not seasonally adjusted) activity was down 8.9% compared to September 2017. About 70% of local markets were down on a y-o-y basis, led primarily by declines in major urban centres in British Columbia, along with Calgary, Edmonton and Winnipeg. “The balance between the number of home buyers and suitable homes varies depending on location, housing type and price range,” said CREA President Barb Sukkau. “Differences in market balance will likely come into sharper focus as interest rates rise and cause this year’s new mortgage stress-test to become even more restrictive. A professional REALTOR® is your best source for information and guidance in negotiating a purchase or sale of a home during these changing times,” said Sukkau. The number of newly listed homes rose 3% between August and September, led by the Lower Mainland and the Greater Toronto Area (GTA). More than half of all local markets posted a monthly increase in new listings, which was offset by declines in excess of 3% in more than half of the remaining local markets. With sales down slightly and new listings up, the national sales-to-new listings ratio eased to 54.4% in September compared to 56.2% in July and August. The long-term average for this measure of market balance is 53.4%. Considering the degree and duration to which market balance readings are above or below their long-term average is a way of gauging whether local housing market conditions favour buyers or sellers. As a rule of thumb, measures of market balance that are within one standard deviation of their long-term average are generally consistent with balanced market conditions. Based on a comparison of the sales-to-new listings ratio with the long-term average, about three-quarters of all local markets were in balanced market territory in September 2018. The number of months of inventory is another important measure for the balance between housing supply and demand. It represents how long it would take to liquidate current inventories at the current rate of sales activity. There were 5.3 months of inventory on a national basis at the end of August 2018. While this is in line with the measure’s long-term average nationally, the number of months of inventory is well above its long-term average in all Prairie provinces and in Newfoundland & Labrador. Apartment units posted the largest y-o-y price gains in September (+8.4%), followed by townhouse/row units (+4.5%). Meanwhile, one-storey and two-storey single family home prices were little changed on a y-o-y basis in September (-0.3% and -0.3% respectively). Trends continue to vary widely among the 17 housing markets tracked by the MLS® HPI. In British Columbia, home price gains are diminishing on a y-o-y basis in the Lower Mainland (Greater Vancouver (GVA): +2.2%; Fraser Valley: +8.5%). Meanwhile, prices in Victoria were up 8.7% y-o-y in September. Elsewhere on Vancouver Island they climbed 13.2%. Among the housing markets in the Greater Golden Horseshoe region that are tracked by the index, home prices were up from year-ago levels in Guelph (+8%), Hamilton-Burlington (+6.1%), the Niagara Region (+5.9%), the GTA (+2%), and Oakville-Milton (+1.4%). By contrast, home prices slipped lower in Barrie and District (-3.6%). Across the Prairies, benchmark home prices remained below year-ago levels in Calgary (-2.6%), Edmonton (-2.6%), Regina (-4.7%) and Saskatoon (-1.9%). The MLS® HPI provides the best way of gauging price trends because average price trends are strongly distorted by changes in the mix of sales activity from one month to the next. The actual (not seasonally adjusted) national average price for homes sold in September 2018 was just under $487,000, little changed (+0.2%) from the same month last year. The national average price is heavily skewed by sales in the GVA and GTA, two of Canada’s most active and expensive markets. Excluding these two markets from calculations cuts almost $104,000 from the national average price, trimming it to just over $383,000. Ottawa, ON, September 17, 2018 – Statistics released today by The Canadian Real Estate Association (CREA) show a small increase in national home sales between July and August 2018. National home sales rose 0.9% from July to August. Actual (not seasonally adjusted) activity was down 3.8% from August 2017. The number of newly listed homes was unchanged from July to August. The MLS® Home Price Index (HPI) was up 2.5% year-over-year (y-o-y) in August. The national average sale price edged up 1% y-o-y in August. National home sales via Canadian MLS® Systems edged up by 0.9% in August 2018, marking a fourth consecutive monthly gain. 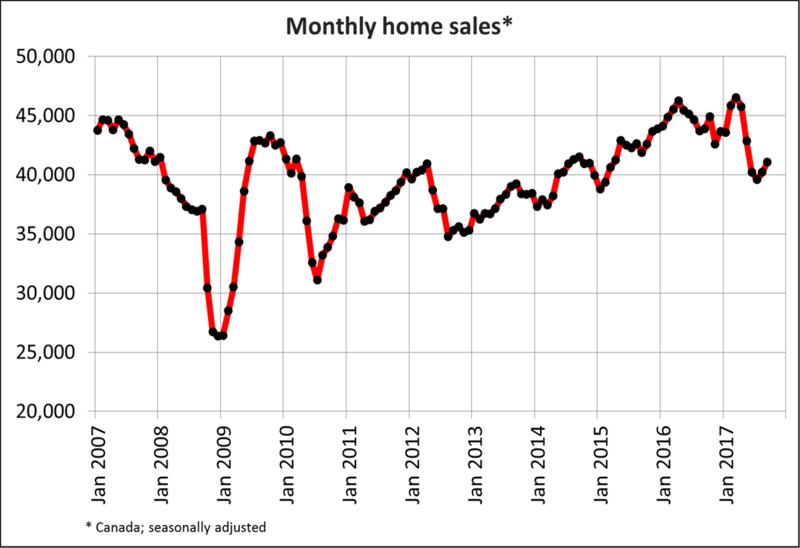 However, sales activity is still running below levels in most other months going back to early 2014. Roughly half of all local markets recorded an increase in sales from July to August, led again by the Greater Toronto Area (GTA), along with gains in Montreal and Edmonton. Actual (not seasonally adjusted) activity was down 3.8% y-o-y in August, due mainly to declines in major urban centres in British Columbia. “The new stress-test on mortgage applicants implemented earlier this year continues to weigh on national home sales,” said CREA President Barb Sukkau. “The degree to which the stress-test continues to sideline home buyers varies depending on location, housing type and price range. All real estate is local, and REALTORS® remain your best source for information about sales and listings where you live or might like to in the future,” said Sukkau. The number of newly listed homes was unchanged between July and August, as new supply gains in the Greater Vancouver Area (GVA) and Montreal offset declines in the GTA and Winnipeg. With sales up slightly and new listings unchanged, the national sales-to-new listings ratio edged up to 56.6% in August compared to 56.2% in July. The long-term average for this measure of market balance is 53.4%. Based on a comparison of the sales-to-new listings ratio with the long-term average, about two-thirds of all local markets were in balanced market territory in August 2018. There were 5.2 months of inventory on a national basis at the end of August 2018, right in line with the long-term average for the measure. The Aggregate Composite MLS® Home Price Index (MLS® HPI) was up 2.5% y-o-y in August 2018. Apartment units posted the largest y-o-y price gains in August (+9.5%), followed by townhouse/row units (+4.3%). Meanwhile, one-storey and two-storey single family home prices were little changed on a y-o-y basis in August (+0.4% and -0.4% respectively). As of this release, housing market coverage for MLS® HPI now includes Hamilton-Burlington and the Niagara Region. Trends continue to vary widely among the 17 housing markets tracked by the MLS® HPI. Home price gains are diminishing on a y-o-y basis in the Lower Mainland of British Columbia (GVA: +4.1%; Fraser Valley: +10.7%). Prices in Victoria were up 8.5% y-o-y in August. Elsewhere on Vancouver Island, prices climbed 13.6%. Among the Greater Golden Horseshoe housing markets tracked by the index, home prices were up from year-ago levels in Hamilton-Burlington (+7.2%), the Niagara Region (+6.6%), Guelph (+5.5%), the GTA (+1.4%) and Oakville-Milton (+1.2%). By contrast, home prices remained down on a y-o-y basis in Barrie and District (-2.7%). In the Prairies, benchmark home prices remained down on a y-o-y basis in Calgary (-2.2%), Edmonton (-2.1%), Regina (-4.8%) and Saskatoon (-2.3%). The actual (not seasonally adjusted) national average price for homes sold in August 2018 was just over $475,500, up 1% from the same month last year. The national average price is heavily skewed by sales in the GVA and GTA, two of Canada’s most active and expensive markets. Excluding these two markets from calculations cuts almost $94,000 from the national average price, trimming it to just under $382,000. Ottawa, ON, August 15, 2018 – Statistics released today by The Canadian Real Estate Association (CREA) show national home sales were up from June to July 2018. National home sales rose 1.9% from June to July. Actual (not seasonally adjusted) activity was down 1.3% from July 2017. The number of newly listed homes edged down 1.2% from June to July. The MLS® Home Price Index (HPI) in July was up 2.1% year-over-year (y-o-y). The national average sale price edged up 1% y-o-y. 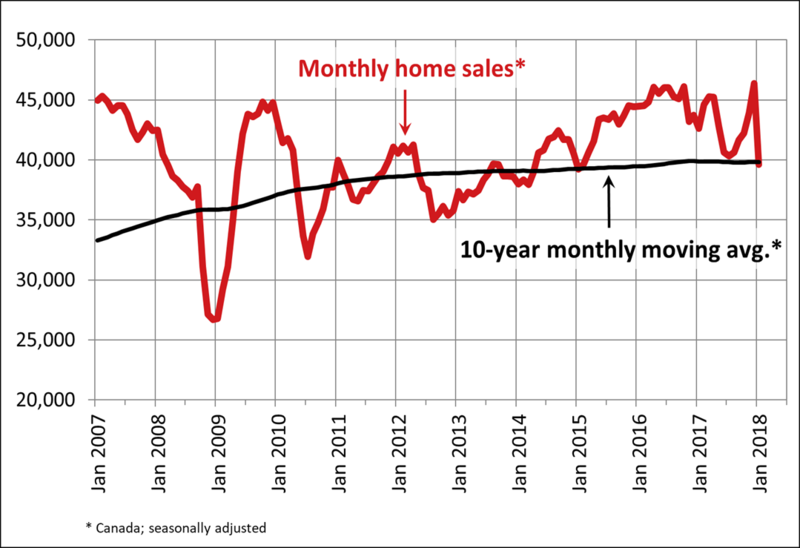 National home sales via Canadian MLS® Systems rose 1.9% in July 2018, building on increases in each of the two previous months but still running below levels recorded from mid-2013 to the end of last year (Chart A). Led by the Greater Toronto Area (GTA), more than half of all local housing markets reported an increase sales activity from June to July. Actual (not seasonally adjusted) activity was down 1.3% y-o-y. The result reflects fewer sales in major urban centres in British Columbia and an offsetting improvement in activity in the GTA. “This year’s new stress-test on mortgage applicants continues to weigh on home sales but its effect may be starting to fade slightly in Toronto and nearby markets,” said CREA President Barb Sukkau. “The degree to which the stress-test continues to sideline home buyers varies depending on location, housing type and price range. All real estate is local, and REALTORS® remain your best source for information about sales and listings where you live or might like to in the future,” said Sukkau. The number of newly listed homes retreated 1.2% in July and stood below monthly levels recorded over most of the past eight years. New listings were down in more than half of all local markets, led by Calgary, Edmonton and Greater Vancouver (GVA). Fewer new listings in these markets more than offset an increase in new supply in the GTA. With sales up and new listings down, the national sales-to-new listings ratio tightened further to reach 55.9% in July. This reading nonetheless remains within short reach of the long-term average of 53.4% for this measure of market balance. Considering the degree and duration to which market balance readings are above or below their long-term average is a useful way of gauging whether local housing market conditions favour buyers or sellers. As a rule of thumb, measures of market balance that are within one standard deviation of their long-term average are generally consistent with balanced market conditions. Based on a comparison of the sales-to-new listings ratio with the long-term average, about two-thirds of all local markets were in balanced market territory in July 2018. There were 5.3 months of inventory on a national basis at the end of July 2018, down from 5.4 months in June and near the long-term average of 5.2 months. The Aggregate Composite MLS® Home Price Index (MLS® HPI) was up 2.1% y-o-y in July 2018. This represents the first acceleration in y-o-y home price growth since April 2017. It also suggests that the dip in home prices last summer and their subsequent rebound in and around the GTA may contribute to further y-o-y gains in the months ahead. Apartment units posted the largest y-o-y price gains in July (+10.1%), followed by townhouse/row units (+4.7%). By contrast, one-storey and two-storey single family home prices were again down from year-ago levels in July (-0.7% and -1.5% respectively) but the declines were noticeably smaller than in recent months. Trends continue to vary widely among the 15 housing markets tracked by the MLS® HPI, with home prices up from year-ago levels in eight of them, little changed in two of them and down in the remainder. Home price gains are diminishing on a y-o-y basis in the Lower Mainland of British Columbia (GVA: +6.7%; Fraser Valley: +13.8%), Victoria (+8.2%) and elsewhere on Vancouver Island (+13.7%). Among Golden Horseshoe housing markets tracked by the index, home prices remained above year-ago levels in Guelph (+4.1%) and stabilized in Oakville-Milton (+0.1%). By contrast, home prices remained down on a y-o-y basis in the GTA (-0.6%) and Barrie and District (-3%). In the Prairies, benchmark home prices remained down on a y-o-y basis in Calgary (-1.7%), Edmonton (-1.3%), Regina (-4.8%) and Saskatoon (-2.1%). MLS® HPI provides the best way of gauging price trends because average price trends are strongly distorted by changes in the mix of sales activity from one month to the next. The actual (not seasonally adjusted) national average price for homes sold in July 2018 was just under $481,500, up 1% from the same month last year. This was the first year-over-year increase since January. The national average price is heavily skewed by sales in the GVA and GTA, two of Canada’s most active and expensive markets. Excluding these two markets from calculations cuts close to $100,000 from the national average price, trimming it to just under $383,000. Interested in Real Estate in Winnipeg? Are you interested in investing in Real Estate in Winnipeg? Here is some information about Winnipeg and the surrounding area that you may want to know before making the move. Here are some links to city and province websites that you will need to know when buying real estate in Winnipeg. For more information about Winnipeg and your real estate needs, contact RE/MAX professionals today! Ottawa, ON August 1st, 2018 – Canadian parents have always asked their REALTORS® about nearby schools when considering a new home and starting today they’ll be able to access school catchment information when looking at property listings on REALTOR.ca, Canada’s #1 real-estate website. New school catchment information on REALTOR.ca will rollout nationally in phases, with major centers available now (see list below). Coverage will grow to 80% of school boards in Canada by September. An additional feature allowing parents to search for a property within a particular school’s catchment area will be available later in the fall. Earlier this spring, CREA partnered with Local Logic to add neighbourhood specific lifestyle information to REALTOR.ca property listings. “We’re very excited to continue expanding our relationship with REALTOR.ca and work with them to develop meaningful products that showcase advances in Canadian real estate technology,” stated Vincent-Charles Hodder, CEO of Local Logic. To learn more about the new school catchment feature, please visit REALTOR.ca and look for a listing in the current coverage zones. Cities to be added by September: St. John’s, Barrie, Kelowna, Abbotsford-Mission, Sudbury, Kingston, Saguenay, Trois-Rivières, Guelph, Moncton, Brantford, Saint John, Peterborough, Thunder Bay, Lethbridge, Nanaimo, Kamloops, Belleville, Chatham-Kent, Fredericton, Chilliwack, Sherbrooke. Local Logic collects and shares location characteristics to assist prospective buyers, and real estate professionals, in finding just the right spot. Scores ranging from walkability, nearby transit and even street sound levels paint a virtual picture of the location before even setting foot on the property. REALTOR.ca is owned and operated by The Canadian Real Estate Association (CREA), one of Canada’s largest single-industry trade associations. CREA works on behalf of 125,000 REALTORS® who contribute to the economic and social well-being of communities across Canada. Together they advocate for property owners, buyers and sellers. REALTOR.ca provides trusted, up-to-date and comprehensive property advertisements for residential, commercial and rental properties across Canada. Whether you have just started looking or you are ready to make that important purchase, REALTOR.ca connects you to valuable resources and local REALTORS® to help you find your dream property. Ottawa, ON, July 16, 2018 – Statistics released today by The Canadian Real Estate Association (CREA) show national home sales were up from May to June 2018. The number of newly listed homes retreated 1.8% in June, and also stood below levels for the month in recent years. New listings declined in a number of large urban markets, including those in British Columbia’s Lower Mainland, Calgary, Edmonton, Ottawa and Montreal. With sales up and new listings down, the national sales-to-new listings ratio tightened to 54.3% in June compared to 51.2% in May. The June reading was within short reach of the long-term average of 53.4%. Consideration of the degree and duration to which market balance readings are above or below their long-term average is a useful way to gauge whether local housing market conditions favour buyers or sellers. Market balance measures that are within one standard deviation of their long-term average are generally consistent with balanced market conditions. Based on a comparison of the sales-to-new listings ratio with its long-term average, about two-thirds of all local markets were in balanced market territory in June 2018. There were 5.4 months of inventory on a national basis at the end of June 2018, down from the three-year high of 5.6 months in May. The long-term average for the measure is 5.2 months. Decelerating y-o-y home price gains have largely reflected trends at play in Greater Golden Horseshoe (GGH) housing markets tracked by the index. Home prices in the region has begun to stabilize and trend higher on a month-over-month basis in recent months. Apartment units again posted the largest y-o-y price gains in June (+11.3%), followed by townhouse/row units (+4.9%); however, price gains for these homes have decelerated this year. By contrast, one-storey and two-storey single family home prices were again down from year-ago levels in June (-1.8% and -4.1% respectively). With home prices having climbed above year-ago levels in 8 of the 15 markets tracked by the index, price trends continue to vary among housing markets. Home price growth is moderating in the Lower Mainland of British Columbia (Greater Vancouver Area: +9.5% y-o-y; Fraser Valley: +18.4%), Victoria (+10.6%) and elsewhere on Vancouver Island (+16.5%). Within the GGH region, price gains have slowed considerably on a y-o-y basis but remain above year-ago levels in Guelph (+3.5%). By contrast, home prices in the GTA, Oakville-Milton and Barrie were down from where they stood one year earlier (GTA: -4.8%; Oakville-Milton: -2.9%; Barrie and District: -6.5%). The declines reflect rapid price growth recorded one year ago and masks recent month-over-month price gains in these markets. Calgary and Edmonton benchmark home prices were down slightly on a y-o-y basis (Calgary: -1%; Edmonton: -1.5%), while prices declines in Regina and Saskatoon were comparatively larger (-6.1% and -2.9%, respectively). The MLS® Home Price Index (MLS® HPI) provides the best way of gauging price trends because average price trends are strongly distorted by changes in the mix of sales activity from one month to the next. The actual (not seasonally adjusted) national average price for homes sold in June 2018 was just under $496,000, down 1.3% from one year earlier. While this marked the fifth month in a row in which the national average price was down on a y-o-y basis, it was the smallest decline among them. The national average price is heavily skewed by sales in the Greater Vancouver and GTA, two of Canada’s most active and expensive markets. Excluding these two markets from calculations cuts almost $107,000 from the national average price, trimming it to just over $389,000. Ottawa, ON, June 15, 2018 – Statistics released today by The Canadian Real Estate Association (CREA) show national home sales were little changed from April to May 2018. National home sales edged down 0.1% from April to May. Actual (not seasonally adjusted) activity was down 16.2% from May 2017. The number of newly listed homes rose 5.1% from April to May. The MLS® Home Price Index (HPI) in May was up 1% year-over-year (y-o-y). The national average sale price declined by 6.4% y-o-y in May. Slightly more than half of all local housing markets reported fewer sales in May compared to April, led by the Okanagan region, Chilliwack and the Fraser Valley, together with the Durham region of the Greater Toronto Area (GTA) and Quebec City. Declines in activity were offset by gains in Calgary, Thunder Bay, Brantford, London and St. Thomas, Oakville-Milton and the Quinte Region west of Kingston. A small increase in GTA sales also supported the national tally. Actual (not seasonally adjusted) activity was down 16.2% compared to May 2017 and reached a seven-year low for the month. It also stood 5.5% below the 10-year average for the month of May. Activity came in below year-ago levels in about 80% of all local markets, led overwhelmingly by those in and around the Lower Mainland of British Columbia and the Greater Golden Horseshoe (GGH) region in Ontario. “The stress-test that came into effect this year for homebuyers with more than a twenty percent down payment is continuing to suppress sales activity,” said CREA President Barb Sukkau. “The extent to which it is sidelining home buyers varies among housing markets and price ranges. All real estate is local, and REALTORS® remain your best source for information about sales and listings where you live or might like to in the future,” said Sukkau. The number of newly listed homes rose 5.1% in May but remained below year-ago levels. New listings rose in about three-quarters of all local markets, led by Edmonton, Calgary, Montreal, Quebec City, Ottawa and the GTA. With new listings up and sales virtually unchanged, the national sales-to-new listings ratio eased to 50.6% in May compared to 53.2% in April and stayed within short reach of the long-term average of 53.4%. A national sales-to-new listings ratio of between 40% and 60% is generally consistent with a balanced national housing market, with readings below and above this range indicating buyers’ and sellers’ markets respectively; however, the range consistent with balanced market conditions varies among local markets. For that reason, considering the degree and duration that market balance readings are above or below their long-term average is a better way of gauging whether local housing market conditions favour buyers or sellers. Market balance measures that are within one standard deviation of their long-term average are generally consistent with balanced market conditions. Based on a comparison of the sales-to-new listings ratio with its long-term average, about two-thirds of all local markets were in balanced market territory in May 2018. There were 5.7 months of inventory on a national basis at the end of May 2018. While this marks a three-year high for the measure, it remains near the long-term average of 5.2 months. Decelerating y-o-y home price gains largely reflect trends among Greater Golden Horseshoe (GGH) housing markets tracked by the index. While home prices in the region have stabilized and begun trending higher on a monthly basis, rapid price gains recorded one year ago have contributed to deteriorating y-o-y price comparisons. If recent trends remain intact, year-over-year comparisons will likely improve in the months ahead. Apartment units again posted the largest y-o-y price gains in May (+12.7%), followed by townhouse/row units (+4.9%). By contrast, one-storey and two-storey single family home prices were down (-1.5% and -4.7% y-o-y respectively). Benchmark home prices in May were up from year-ago levels in 8 of the 15 markets tracked by the index. Composite benchmark home prices in the Lower Mainland of British Columbia continue to trend upward after having dipped briefly in the second half of 2016 (Greater Vancouver (GVA): +11.5% y-o-y; Fraser Valley: +20.6% y-o-y). Apartment and townhouse/row units have been largely driving this regional trend while single family home prices in the GVA have stabilized. In the Fraser Valley, single family home prices have also started rising. Benchmark home prices were up by 11.5% on a y-o-y basis in Victoria and by 18.1% elsewhere on Vancouver Island. Within the GGH region, price gains have slowed considerably on a y-o-y basis but remain above year-ago levels in Guelph (+3.8%). By contrast, home prices in the GTA, Oakville-Milton and Barrie were down from where they stood one year earlier (GTA: -5.4% y-o-y; Oakville-Milton: -5.9% y-o-y; Barrie and District: -6.3% y-o-y). This reflects rapid price growth recorded one year ago and masks recent month-over-month price gains in these markets. Calgary and Edmonton benchmark home prices were down slightly on a y-o-y basis in May (Calgary: -0.5% y-o-y; Edmonton: -0.9% y-o-y), while prices in Regina and Saskatoon were down more noticeably from year-ago levels (-6.2% y-o-y and -2.7% y-o-y, respectively). The actual (not seasonally adjusted) national average price for homes sold in May 2018 was just over $496,000, down 6.4% from one year earlier. The national average price is heavily skewed by sales in the GVA and GTA, two of Canada’s most active and expensive markets. Excluding these two markets from calculations cuts more than $104,000 from the national average price to just over $391,100 and trims the y-o-y decline to 2%. Ottawa, ON, May 15, 2018 – Statistics released today by The Canadian Real Estate Association (CREA) show national home sales fell from March to April 2018. National home sales fell 2.9% from March to April. Actual (not seasonally adjusted) activity was down 13.9% from April 2017. The number of newly listed homes declined 4.8% from March to April. The MLS® Home Price Index (HPI) in April was up 1.5% year-over-year (y-o-y). The national average sale price declined by 11.3% y-o-y in April. National home sales via Canadian MLS® Systems declined by 2.9% in April 2018 to the lowest level in more than five years (Chart A). About 60% of all local housing markets reported fewer sales, led by the Fraser Valley, Calgary, Ottawa and Montreal. Actual (not seasonally adjusted) activity was down 13.9% compared to April of last year and hit a seven-year low for the month. It also stood 6.9% below the 10-year average for the month. Activity was below year-ago levels in about 60% of all local markets, led overwhelmingly by the Lower Mainland of British Columbia and by markets in and around Ontario’s Greater Golden Horseshoe (GGH) region. “The stress-test that came into effect this year for homebuyers with more than a twenty percent down payment continued to cast its shadow over sales activity in April,” said CREA President Barb Sukkau. “Its impact on housing markets varies by region,” she added. “A professional REALTOR® is your best source for information and guidance in negotiations to purchase or sell a home during these changing times,” said Sukkau. The number of newly listed homes declined 4.8% in April. Having reached a nine-year low for the month, new listings stood 12% below the 10-year monthly moving average. With sales having fallen by less than new listings, the national sales-to-new listings ratio firmed slightly to 53.7% in April compared to 52.6% in March. The long-term average for the measure is 53.4%. A national sales-to-new listings ratio of between 40% and 60% is generally consistent with a balanced national housing market, with readings below and above this range indicating buyers’ and sellers’ markets respectively; however, the range consistent with balanced market conditions varies at the local market level. Based on a comparison of the sales-to-new listings ratio with its long-term average, about 60% of all local markets were in balanced market territory in April 2018. There were 5.6 months of inventory on a national basis at the end of April 2018, the highest level since September 2015. The long-term average for the measure is 5.2 months. Decelerating y-o-y home price gains largely reflect trends among GGH housing markets tracked by the index. Home prices in the region have stabilized and have begun trending higher on a monthly basis; however, rapid price gains recorded one year ago have contributed to deteriorating y-o-y price comparisons. Apartment units again posted the largest y-o-y price gains in April (+14.7%), followed by townhouse/row units (+6.5%). By contrast, one-storey and two-storey single family home prices were down (-1.1% and -4.8% y-o-y respectively). With this release, housing market coverage for MLS® HPI now includes Barrie and District. Benchmark home prices in April were up from year-ago levels in 9 of the 15 markets tracked by the index. Composite benchmark home prices in the Lower Mainland of British Columbia continue to trend upward after having dipped briefly in the second half of 2016 (Greater Vancouver (GVA): +14.3% y-o-y; Fraser Valley: +22.7% y-o-y). Apartment and townhouse/row units have been largely driving this regional trend while single family home prices in the GVA have stabilized. In the Fraser Valley, single family home prices have now also begun to rise. Benchmark home prices continued to rise by about 14% on a y-o-y basis in Victoria and by about 20% elsewhere on Vancouver Island. Within the GGH region, price gains have slowed considerably on a y-o-y basis but remain above year-ago levels in Guelph (+5.9%). By contrast, home prices in the Greater Toronto Area (GTA), Oakville-Milton and Barrie and District were down from where they stood one year earlier (GTA: -5.2% y-o-y; Oakville-Milton: -8.7% y-o-y; Barrie and District: -8.4% y-o-y). This reflects rapid price gains recorded one year ago and masks recent month-over-month price gains in these markets. Calgary and Edmonton benchmark home prices were again little changed on a y-o-y basis (Calgary: +0.1% y-o-y; Edmonton: -0.9% y-o-y), while prices in Regina and Saskatoon remained down from year-ago levels (-6.5% y-o-y and -3.4% y-o-y, respectively). The actual (not seasonally adjusted) national average price for homes sold in April 2018 was just over $495,000, down 11.3% from one year earlier. The national average price is heavily skewed by sales in the GVA and GTA, two of Canada’s most active and expensive markets. Excluding these two markets from calculations cuts more than $109,000 from the national average price to just under $386,100 and trims the y-o-y decline to 4.1%. Ottawa, ON, April 13, 2018 – Statistics released today by The Canadian Real Estate Association (CREA) show national home sales edged higher from February to March 2018. National home sales inched up 1.3% from February to March. Actual (not seasonally adjusted) activity was down 22.7% from last year’s all-time March record. The number of newly listed homes rose 3.3% from February to March. The MLS® Home Price Index (HPI) in March was up 4.6% year-over-year (y-o-y). The national average sale price declined by 10.4% y-o-y in March. Home sales via Canadian MLS® Systems edged up 1.3 % from February to March 2018. Despite having improved marginally in March, national sales activity in the first quarter slid to the lowest quarterly level since the first quarter of 2014. March sales were up from the previous month in over half of all local housing markets, led by Ottawa and Montreal. Monthly sales gains were offset by declines in B.C.’s Lower Mainland, the Okanagan Region, Chilliwack, Calgary and Edmonton. Actual (not seasonally adjusted) activity was down 22.7% from record activity logged for March last year and marked a four-year low for the month. It also stood 7% below the 10-year average for the month. Activity came in below year-ago levels in more than 80% of all local markets, including every major urban centre except Montreal and Ottawa. The vast majority of year-over-year declines were well into double digits. “Government policy changes have made home buyers and sellers increasingly uncertain about the outlook for home prices,” said CREA President Andrew Peck. “The extent to which these changes have impacted housing market sentiment varies by region,” he added. “A professional REALTOR® is your best source for information and guidance in negotiations to purchase or sell a home during these changing times,” said Peck. The number of newly listed homes rose 3.3% in March. However, new listings have still not recovered from the 21.1% plunge recorded between December 2017 and January 2018 – the largest month-over-month decline on record by a large margin. With sales up by less than new listings in March, the national sales-to-new listings ratio eased to 53% in March. The long-term average for the measure is 53.4%. A national sales-to-new listings ratio of between 40% and 60% is generally consistent with a balanced national housing market, with readings below and above this range indicating buyers’ and sellers’ markets respectively. That said, the range consistent with balanced market conditions varies among local markets. For that reason, considering the degree and duration that market balance readings are above or below their long-term average is a better way of gauging whether local housing market conditions favour buyers or sellers. Market balance measures that are within one standard deviation of the long-term average are generally consistent with balanced market conditions. A national sales-to-new listings ratio of between 40% and 60% is generally consistent with a balanced national housing market, with readings below and above this range indicating buyers’ and sellers’ markets respectively. That said, the balanced range can vary among local markets. For that reason, considering the degree and duration that market balance is above or below its long-term average is a better way of gauging whether local housing market conditions favour buyers or sellers. Market balance measures that are within one standard deviation of the long-term average are generally consistent with balanced market conditions. Based on a comparison of the sales-to-new listings ratio with its long-term average, more than 60% of all local markets were in balanced market territory in March 2018. There were 5.3 months of inventory on a national basis at the end of February 2018 – the highest level in two-and-a-half years and in line with the long-term average of 5.2 months. The Aggregate Composite MLS® HPI rose 4.6% y-o-y in March 2018. This was the 11th consecutive deceleration in y-o-y gains, continuing a trend that began last spring. It was also the smallest y-o-y increase since December 2013. Slowing y-o-y home price growth largely reflects trends among Greater Golden Horseshoe (GGH) housing markets tracked by the index. Although home prices in the region have stabilized or begun to show tentative signs of moving higher in recent months, y-o-y comparisons may deteriorate further due to rapid price gains one year ago. Apartment units again posted the largest y-o-y price gains in January (+17.8%), followed by townhouse/row units (+9.4%), and one-storey single family homes (+1.3%). As expected, two-storey single family home prices were down (-2%) from a year ago. Despite having stabilized over the second half of last year, y-o-y declines for single family home prices may persist over the first half of 2018. As of this release, housing market coverage for the MLS® HPI now includes Edmonton. Benchmark home prices in March were up from year-ago levels in 9 of the 14 markets tracked by the index. Composite benchmark home prices in the Lower Mainland of British Columbia continue to trend upward after having dipped briefly during the second half of 2016 (Greater Vancouver (GVA): +16.1% y-o-y; Fraser Valley: +24.4% y-o-y). Apartment and townhouse/row units have been driving this regional trend in recent months while single family home prices in the GVA have held steady. In the Fraser Valley, single family home prices have also begun to rise. Benchmark home prices continued to rise by about 15% on a y-o-y basis in Victoria and by about 20% elsewhere on Vancouver Island. Within the GGH region, price gains have slowed considerably on a y-o-y basis but remain above year-ago levels in Guelph (+7.5%). Meanwhile home prices in the GTA and Oakville-Milton were down in March compared to one year earlier (GTA: -1.5% y-o-y; Oakville-Milton: -7.1% y-o-y). These declines largely reflect price trends one year ago and mask evidence that home prices in the region have begun trending higher. Calgary and Edmonton benchmark home prices were little changed on a y-o-y basis (Calgary: +0.3% y-o-y; Edmonton: -0.5% y-o-y), while prices in Regina and Saskatoon remained down from year-ago levels (-4.6% y-o-y and -3.4% y-o-y, respectively). The actual (not seasonally adjusted) national average price for homes sold in March 2018 was just over $491,000, down 10.4% from one year earlier. The national average price is heavily skewed by sales in the GVA and GTA, two of Canada’s most active and expensive markets. Excluding these two markets from calculations cuts almost $108,000 from the national average price, reducing it to $383,000 and trimming the y-o-y decline to just 2%. Ottawa, ON, March 15, 2018 – Statistics released today by The Canadian Real Estate Association (CREA) show national home sales declined further in February 2018. National home sales declined by 6.5% from January to February. Actual (not seasonally adjusted) activity was down 16.9% year-over-year (y-o-y) in February. The number of newly listed homes recovered by 8.1% from January to February. The MLS® Home Price Index (HPI) in February was up 6.9% y-o-y. The national average sale price declined by 5% y-o-y in February. Home sales via Canadian MLS® Systems were down 6.5% in February. This marks the second consecutive monthly decline following the record set in December 2017 and the lowest reading in nearly five years. February sales were down from the previous month in almost three-quarters of all local housing markets, with large monthly declines in and around Greater Vancouver (GVA) and Greater Toronto (GTA). a five-year low for the month of February. Sales also stood 7% below the 10-year average for the month of February. Sales activity came in below year-ago levels in 80% of all local markets in February, including those nearby and within Ontario’s Greater Golden Horseshoe (GGH) region. “Sales activity is down in many, but not all, housing markets compared to the end of last year, and varies depending on price range, location and property type,” said CREA President Andrew Peck. “All real estate is local,” he added. “A professional REALTOR® is your best source for information and guidance in negotiations to purchase or sell a home during these changing times,” said Peck. The number of newly listed homes recovered by 8.1% in February following a plunge of more than 20% in January. Despite the monthly increase in February, new listings nationally were still lower than monthly levels recorded in every month last year except January, and came in 6.4% below the 10-year monthly average and 14.6% below the peak reached in December 2017. New supply was up in about three-quarters of local markets. The monthly increase was led by B.C.’s Lower Mainland, the GTA, Ottawa and Montreal; despite the monthly rise in new supply, these markets remain balanced or continue to favour sellers. With sales down and new listings up in February, the national sales-to-new listings ratio eased to 55% compared to 63.7% in January. This returned the ratio close to where it was during the second half of last year. Based on a comparison of the sales-to-new listings ratio with its long-term average, almost three-quarters of all local markets were in balanced market territory in February 2018. The Aggregate Composite MLS® HPI rose by 6.9% y-o-y in February 2018. This was the 10th consecutive deceleration in y-o-y gains, continuing a trend that began last spring. It was also the smallest y-o-y increase since October 2015. Slowing y-o-y home price growth largely reflects trends for GGH housing markets tracked by the index. Prices in the region have stabilized or begun to show tentative signs of moving higher in recent months; however, year-over-year comparisons are likely to continue to deteriorate further due to rapid price gains posted one year ago. Apartment units again posted the largest y-o-y price gains in February (+20.1%), followed by townhouse/row units (+11.8%), one-storey single family homes (+3.5%), and two-storey single family homes (+1%). Benchmark home prices in February were up from year-ago levels in 10 of the 13 markets tracked by the MLS® HPI. Composite benchmark home prices in the Lower Mainland of British Columbia continue to trend higher after having dipped briefly during the second half of 2016 (GVA: +16.9% y-o-y; Fraser Valley: +24.1% y-o-y). Apartment units have been largely driving this regional trend in recent months. Price gains have slowed considerably on a y-o-y basis but remain above year-ago levels in the GTA (+3.2%) and Guelph (+9.3%). While home prices in Oakville-Milton are down slightly from one year ago (-1.9%), the monthly price trends in these markets have begun to show signs of stabilizing or tentative upward movement in recent months. Calgary benchmark home prices were flat (+0.1%) on a y-o-y basis, while prices in Regina and Saskatoon were down from last February (-4.8% y-o-y and -3.8% y-o-y, respectively). The actual (not seasonally adjusted) national average price for homes sold in February 2018 was just over $494,000, down 5% from one year earlier. The decline demonstrates the impact of GTA sales activity on the national average price. The national average price is heavily skewed by sales in the GVA and GTA, two of Canada’s most active and expensive markets. Excluding these two markets from calculations trims more than $112,000 from the national average price, reducing it to just under $382,000. Ottawa, ON, February 15, 2018 – Statistics released today by The Canadian Real Estate Association (CREA) show national home sales fell sharply in January 2018. National home sales declined by 14.5% from December 2017 to January 2018. Actual (not seasonally adjusted) activity was down 2.4% year-over-year (y-o-y) in January. The number of newly listed homes plunged 21.6% from December 2017 to January 2018. The MLS® Home Price Index (HPI) in January was up 7.7% y-o-y. The national average sale price advanced by 2.3% y-o-y. 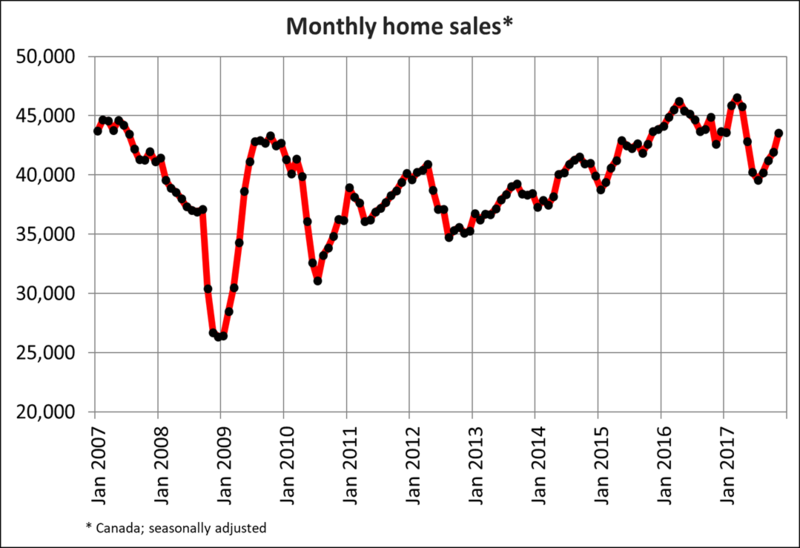 Home sales via Canadian MLS® Systems dropped sharply in January after having climbed to the highest monthly level on record in December. Although activity retreated to the lowest monthly level in three years, January sales were on par with the 10-year monthly average. Activity in January was down in three-quarters of all local markets in Canada, including virtually all major urban centres. Many of the larger declines in percentage terms were posted in Greater Golden Horseshoe (GGH) markets, where sales had picked up late last year following the announcement of tighter mortgage rules coming into effect in January. Actual (not seasonally adjusted) activity was down 2.4% from January 2017 and stood close the 10-year average for the month of January. Sales came in below year-ago levels in about half of all local markets, led by those in the GGH region. By contrast, sales were up on a y-o-y basis in the Lower Mainland of British Columbia and Vancouver Island, the Okanagan Region, Edmonton, Montreal, Greater Moncton and Halifax-Dartmouth. “The piling on of yet more mortgage rule changes that took effect starting New Year’s Day has created homebuyer uncertainty and confusion,” said CREA President Andrew Peck. “At the same time, the changes do nothing to address government concerns about home prices that stem from an ongoing supply shortage in major markets like Vancouver and Toronto. Unless these supply shortages are addressed, concerns will persist,” he added. “A professional REALTOR® is your best source for information and guidance in negotiations to purchase or sell a home during these changing times,” said Peck. The number of newly listed homes plunged 21.6% in January to reach the lowest level since the spring of 2009. New supply was down in about 85% of all local markets, led by a sizeable decline in the GTA. Large percentage declines were also recorded in the Lower Mainland of British Columbia and Vancouver Island, the Okanagan Region, Hamilton-Burlington, Oakville-Milton, Kitchener-Waterloo, London and St. Thomas, Kingston and Ottawa, closely mirroring the list of markets that saw the largest sales declines in January. With new listings having fallen by more than sales, the national sales-to-new listings ratio tightened to 63.6% in January compared to the mid-to-high 50% range to which it held since last May. Based on a comparison of the sales-to-new listings ratio with its long-term average, a little over half of all local markets were in balanced market territory in January 2018. The ratio in many markets moved one standard deviation or more above its long-term average in January due to large declines in new supply. There were 5 months of inventory on a national basis at the end of January 2018, which is close to the long-term average of 5.2 months. The Aggregate Composite MLS® HPI rose by 7.7% y-o-y in January 2018. This was the 9th consecutive deceleration in y-o-y gains, continuing a trend that began last spring. It was also the smallest y-o-y increase since December 2015. The deceleration in y-o-y price gains largely reflects trends among GGH housing markets tracked by the index. While prices in the region have largely stabilized in recent months, ongoing deceleration in y-o-y comparisons reflects the rapid rise in prices one year ago. Apartment units again posted the largest y-o-y price gains in January (+20.1%), followed by townhouse/row units (+12.3%), one-storey single family homes (+4.3%), and two-storey single family homes (+2.3%). As was the case in December, Benchmark home prices in January were up from year-ago levels in 9 of the 13 markets tracked by the MLS® HPI. Composite benchmark home prices in the Lower Mainland of British Columbia continue to trend higher after having dipped briefly during the second half of 2016 (Greater Vancouver: +16.6% y-o-y; Fraser Valley: +22.4% y-o-y). Apartment units have been driving this regional trend in recent months, with single family home prices having stabilized. Benchmark home prices rose by about 14% on a y-o-y basis in Victoria and by about 20% elsewhere on Vancouver Island. These gains are similar to those recorded during the fourth quarter of last year. Price gains have slowed considerably on a y-o-y basis in the GTA, Guelph and Oakville-Milton; however, home prices in the former two markets remain above year-ago levels (GTA: +5.2% y o-y; Guelph: +10.9% y-o-y; Oakville-Milton: -1.2% y-o-y). Monthly prices in these markets have shown signs of stabilizing in recent months after having climbed rapidly in early 2017 and subsequently retreated. Calgary benchmark home prices were down slightly (-0.5% y-o-y), as were home prices in Regina and Saskatoon (-4.9% y-o-y and -4.1% y-o-y, respectively). Benchmark home prices rose by 7.2% y-o-y in Ottawa (led by an 8.1% increase in two-storey single family home prices), by 5.2% in Greater Montreal (led by a 6.2% increase in in two-storey single family home prices) and by 7.5% in Greater Moncton (led by an 11% increase in one-storey single family home prices). The actual (not seasonally adjusted) national average price for homes sold in January 2018 was just over $481,500, up 2.3% from one year earlier. The national average price is heavily skewed by sales in Greater Vancouver and Greater Toronto, two of Canada’s most active and expensive markets. Excluding these two markets from calculations trims $107,500 from the national average price, reducing it to $374,000. In line with financial market expectations, the Bank of Canada announced on January 17, 2018 it was raising its trend-setting overnight lending rate by a quarter point to 1.25%. Although the interest rate hike comes amid solid Canadian economic data, the Bank expects economic growth to slow from this point forward. Additionally, the Bank highlighted a number of reasons why the timing of future rate hikes this year and next is by no means set in stone. Chief among these was uncertainty surrounding the renegotiation of NAFTA, which the Bank said “is weighing increasingly on the outlook.” Indeed, the Bank is already attributing some negative impact on business investment and trade to the issue in its forecast. Failure to renegotiate NAFTA would likely raise the likelihood that the Bank would lower interest rates. The Bank also suggested that strong demand could mean the economy has more potential for growth than previously thought. If so, stronger economic growth would put less upward pressure on inflation and lessen the need by the Bank to raise interest rates to quell inflation. Despite strong job growth, wage growth remains tepid. This also lowers upward pressure on consumer price inflation and reduces the Bank’s need to raise interest to keep inflation to its 2% target. The Bank also said it expects residential investment to be roughly flat over the next two years due to higher interest rates and tightened mortgage regulations that came into effect on January 1. The Bank also indicated that some of the strength in resale housing activity toward the end of 2017 may reflect homebuyers who were determined to purchase before tighter mortgage regulations took effect. The flipside of that pull-forward in demand could be slower home sales activity in the first half of 2018. The Bank again cautioned that future interest rate increases will depend on incoming economic data and the outcome of NAFTA renegotiations. As of January 17, 2018, the benchmark five-year lending rate stood at 5.14%, up from 4.99% at the time of the Bank’s December 6, 2017 announcement. As of January 1, 2018, all mortgages must qualify at, at a minimum, the benchmark five-year lending rate. Canada’s major chartered banks have recently raised their advertised five-year fixed mortgage interest rates, which now range between 3.54% and 5.14%. However, actual five-year fixed mortgage interest rates can be negotiated below advertised rates depending on mortgage applicants’ creditworthiness and the degree to which they do other banking business with the mortgage lender. The next interest rate announcement will be on March 7, 2018. The next Monetary Policy Report, which updates the Bank’s economic forecast, will be released April 18, 2018. Ottawa, ON, January 15, 2018 – Statistics released today by The Canadian Real Estate Association (CREA), show national home sales continued to climb in December 2017. National home sales rose 4.5% from November to December. Actual (not seasonally adjusted) activity was up 4.1% year-over-year (y-o-y). The number of newly listed homes climbed 3.3% from November to December. The MLS® Home Price Index (HPI) in December was up 9.1% y-o-y. The national average sale price advanced by 5.7% y-o-y. Home sales via Canadian MLS® Systems posted their fifth consecutive monthly increase in December 2017, fully recovering from the slump last summer. Activity in December was up in close to 60% of all local markets, led by the Greater Toronto Area (GTA), Edmonton, Calgary, the Fraser Valley, Vancouver Island, Hamilton-Burlington and Winnipeg. Actual (not seasonally adjusted) activity was up 4.1% from December 2016. While activity remained below year-ago levels in the GTA, the decline there was more than offset by some sizeable y-o-y gains in the Lower Mainland of British Columbia, Vancouver Island, Calgary, Edmonton, Ottawa and Montreal. “Monthly momentum for national home sales activity gained strength late last year and further expected economic and job growth will buoy sales activity this year despite slightly higher expected interest rates,” said CREA President Andrew Peck. “Even so, momentum for home sales differs depending on location and type,” he added. “A professional REALTOR® is your best source for information and guidance in negotiations to purchase or sell a home during these changing times,” said Peck. The number of newly listed homes rose 3.3% in December. As in November, the national increase was overwhelmingly due to rising new supply in the GTA. New listings and sales have both trended higher since August. As a result, the sales-to-new listings ratio has remained in the mid-to-high 50% range since then. Considering the degree and duration that the current market balance is above or below its long-term average is a more sophisticated way of gauging whether local housing market conditions favour buyers or sellers. Market balance measures that are within one standard deviation of the long-term average are generally consistent with balanced market conditions. Based on a comparison of the sales-to-new listings ratio with its long-term average, more than two-thirds of all local markets were in balanced market territory in December 2017. The number of months of inventory is another important measure of the balance between housing supply and demand. It represents how long it would take to liquidate current inventories at the current rate of sales activity. There were 4.5 months of inventory on a national basis at the end of December 2017. The measure has been moving steadily lower in tandem with the monthly rise in sales that began last summer. The number of months of inventory in the Greater Golden Horseshoe region (2.1 months) was up sharply from the all-time low reached in March 2017 (0.9 months). Even so, the December reading stood a full month below the region’s long-term average (3.1 months) and reached a seven-month low. 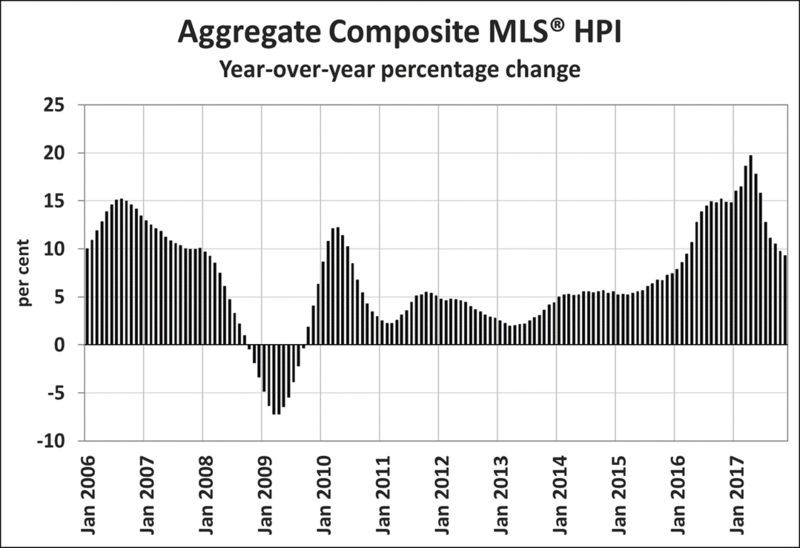 The Aggregate Composite MLS® HPI rose by 9.1% y-o-y in December 2017. This was the 8th consecutive deceleration in y-o-y gains, continuing a trend that began in the spring. It was also the smallest y-o-y increase since February 2016.
basis, only single-family price increases slowed on a y-o-y basis. By comparison, y-o-y price gains picked up for townhouse/row and apartment units. Apartment units again posted the largest y-o-y price gains in December (+20.5%), followed by townhouse/row units (+13%), one-storey single family homes (+5.5%), and two-storey single family homes (+4.5%). Benchmark home prices were up from year-ago levels in 9 of the 13 markets tracked by the MLS® HPI, with Calgary and Oakville-Milton price comparisons tipping slightly into negative territory on a y-o-y basis. After having dipped in the second half of last year, composite benchmark home prices in the Lower Mainland of British Columbia have recovered and now stand at new highs (Greater Vancouver: +15.9% y-o-y; Fraser Valley: +20.9% y-o-y). Benchmark home prices rose by about 14% on a y-o-y basis in Victoria and by about 19% elsewhere on Vancouver Island in December. These y-o-y gains were similar to those recorded in October and November. Price gains have slowed considerably on a y-o-y basis in the GTA, Guelph and Oakville-Milton; however, home prices in the former 2 markets remain above year-ago levels (Greater Toronto: +7.2% y o-y; Guelph: +13.1% y-o-y; Oakville Milton: -0.8% y-o-y). Calgary benchmark home prices were down slightly in December (-0.4% y-o-y), as were home prices in Regina and Saskatoon (-4% y-o-y and -3.7% y-o-y, respectively). The actual (not seasonally adjusted) national average price for homes sold in December 2017 was just over $496,500, up 5.7% from one year earlier. The national average price is heavily skewed by sales in Greater Vancouver and the GTA, two of Canada’s most active and expensive markets. Excluding these two markets from calculations trims almost $116,000 from the national average price to just under $381,000. Ottawa, ON, December 14, 2017 – According to statistics released today by The Canadian Real Estate Association (CREA), national home sales rose strongly in November 2017. National home sales rose 3.9% from October to November. Actual (not seasonally adjusted) activity was up 2.6% from November 2016. The number of newly listed homes climbed 3.5% from October to November. The MLS® Home Price Index (HPI) was up 9.3% year-over-year (y-o-y) in November 2017. The national average sale price edged up 2.9% y-o-y in November. Home sales via Canadian MLS® Systems rose for the fourth month in a row in November 2017, up 3.9% from October. Led by a 16% jump in sales in the Greater Toronto Area (GTA), the surge in sales there accounted for more than two-thirds of the national increase. The continuing rebound put November sales activity a little over halfway between the peak recorded in March 2017 and the low reached in July. Actual (not seasonally adjusted) activity rose 2.6% y-o-y, setting a new record for the month of November. It was the first y-o-y increase since March and was unassisted by the GTA, where activity remains down significantly from year-ago levels. A number of other large markets posted y-o-y activity gains, including Greater Vancouver and the Fraser Valley, Calgary, Edmonton, Ottawa and Montreal. “Some home buyers with more than a twenty percent down payment may be fast-tracking their purchase decision in order to beat the tougher mortgage qualifications test coming into effect next year,” said CREA President Andrew Peck. “National sales momentum remains positive heading toward year-end,” said Gregory Klump, CREA’s Chief Economist. The number of newly listed homes rose 3.5% in November, which reflected a large increase in new supply across the GTA. With sales and new listings having risen by similar magnitudes, the national sales-to-new listings ratio was 56.4% in November, remaining little changed from 56.2% reported in October. A national sales-to-new listings ratio of between 40% and 60% is generally consistent with a balanced national housing market, with readings below and above this range indicating buyers’ and sellers’ markets respectively. That said, the balanced range for the measure can vary among local markets. Considering the degree and duration that the current market balance is above or below its long-term average is a more sophisticated way of gauging whether local housing market conditions favour buyers or sellers. (Market balance measures that are within one standard deviation of the long-term average are generally consistent with balanced market conditions). Based on a comparison of the sales-to-new listings ratio with its long-term average, more than half of all local markets were in balanced market territory in November 2017. There were 4.8 months of inventory on a national basis at the end of November 2017 – down slightly from 4.9 months in October and around 5 months recorded over the summer months, and within close reach of the long-term average of 5.2 months. At 2.4 months, the number of months of inventory in the Greater Golden Horseshoe region is up sharply from the all-time low of 0.8 months reached in February and March. Even so, it remains below the region’s long-term average of 3.1 months. 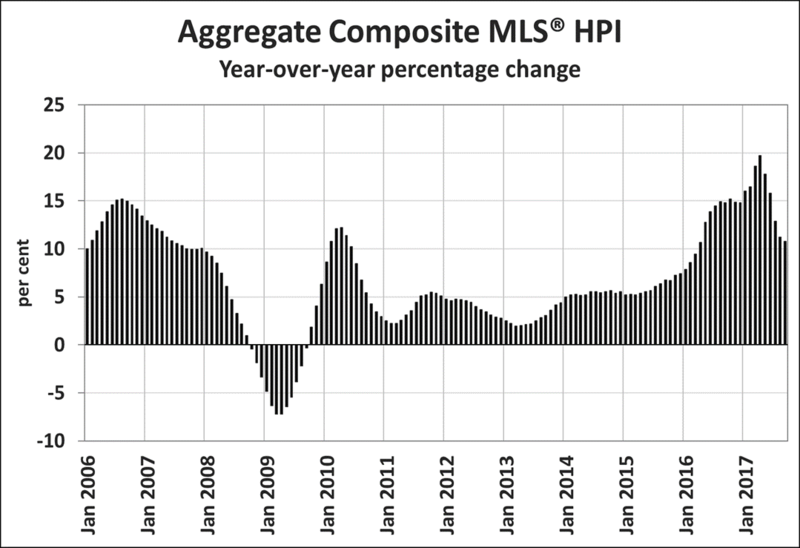 The Aggregate Composite MLS® HPI rose by 9.3% y-o-y in November 2017. This is a further deceleration in y-o-y gains that began in the spring and the smallest increase since February 2016. The deceleration in price gains largely reflects softening price trends in the Greater Golden Horseshoe housing markets tracked by the index, particularly for single-family homes. Apartment units again posted the largest y-o-y gains in November (+19.4%), followed by townhouse/row units (+12.3%), one-storey single family homes (+6%), and two-storey single family homes (+5.3%). Benchmark home prices were up from year-ago levels in 11 of the 13 markets tracked by the MLS® HPI. After having dipped in the second half of last year, benchmark home prices in the Lower Mainland of British Columbia have recovered and now stand at new highs (Greater Vancouver: +14% y-o-y; Fraser Valley: +18.5% y-o-y). Benchmark home prices rose by about 14% on a y-o-y basis in Victoria and by 18.5% elsewhere on Vancouver Island in November, on par with y-o-y gains in October. Price gains have slowed considerably on a y-o-y basis in Greater Toronto, Oakville-Milton and Guelph but remain above year-ago levels (Greater Toronto: +8.4% y-o-y; Oakville-Milton: +3.5% y-o-y; Guelph: +13.4% y-o-y). Calgary benchmark home prices remained just inside positive territory on a y-o-y basis (+0.3%), while prices in Regina and Saskatoon were down from last November (-3.5% y-o-y and -4.1% y-o-y, respectively). The actual (not seasonally adjusted) national average price for homes sold in November 2017 was just under $504,000, up 2.9% from one year earlier. The national average price is heavily skewed by sales in Greater Vancouver and Greater Toronto, two of Canada’s most active and expensive markets. Excluding these two markets from calculations trims more than $120,000 from the national average price (to just above $381,000). Ottawa, ON, December 14, 2017 – The Canadian Real Estate Association (CREA) has updated its forecast for home sales activity via the Multiple Listing Service® (MLS®) Systems of Canadian real estate Boards and Associations in 2017 and 2018. Housing market trends continue to diverge considerably among regions along four general themes: British Columbia; the Greater Golden Horseshoe; oil and natural resource dependent provinces; and everywhere else. Driven by sales trends in the Greater Golden Horseshoe, Ontario home sales have rebounded from the depths reached in the summer, but remain well below the peak reached earlier this year. Recently announced changes to mortgage regulations next year may be motivating some homebuyers to advance their purchase decision before the new rules come into effect in January. Meanwhile, sales activity in British Columbia has improved. Supported by rising activity in the Fraser Valley and on Vancouver Island, sales for the province are currently running about midway between the record levels of early 2016 and the lows reached in late 2016. In the natural resource-intensive provinces of Alberta, Saskatchewan and Newfoundland and Labrador, sales activity is still running at lower levels and supply remains ample. As a result, average prices have flattened in Alberta and eased in Saskatchewan as well as in Newfoundland and Labrador, consistent with their elevated number of months of inventory. In Manitoba, Eastern Ontario, Quebec, New Brunswick, Nova Scotia and Prince Edward Island, sales activity has been steadily improving. Combined with shrinking supply, housing markets in these regions have firmed up and average prices have been making modest gains. CREA’s previous forecast published in September identified further changes to mortgage rules as a key downside risk. Indeed, this risk materialized in October when tighter mortgage regulations that take effect next year were announced. Among other things, the new rules make it tougher for would-be homebuyers with more than a 20% down payment to qualify for a mortgage. These low-ratio mortgages comprise the vast majority of Canadian mortgage originations. Recent research by the Bank of Canada suggests that once they come into effect, tightened mortgage rules will reduce sales activity in housing markets across Canada, particularly in and around Toronto and Vancouver. Additionally, with some homebuyers likely advancing their purchase decision before the new rules come into effect next year, the “pull-forward” of these sales may come at the expense of sales in the first half of 2018. Meanwhile, other potential homebuyers are anticipated to stay on the sidelines as they save up a larger down payment before purchasing and contributing to a modest improvement in sales activity in the second half of 2018. Taking these factors into account has led CREA to narrow its forecast decline in sales activity in 2017 and downwardly revise its sales forecast for 2018. The anticipated decline in Canadian sales activity in the first half of 2018 due to an erosion of housing affordability from tighter mortgage regulations may mitigated by a number of factors. Some buyers may qualify for a smaller mortgage by purchasing a lower priced home, while others may opt to stretch the amortization period when financing their purchase. National sales activity is projected to decline by 4% to 513,900 units in 2017. The majority of the annual decline reflects weakened activity in Ontario, where sales fell sharply over the spring and summer in the wake of the province’s Fair Housing Plan that was announced in April. While British Columbia is projected to record almost 9,000 fewer sales in 2017, this decline will be almost fully offset by higher activity in Quebec and Alberta. The national average price is expected to reach $510,400 this year, up 4.2% from 2016. In recent years, average prices have been heavily skewed by large swings in British Columbia and Ontario sales, particularly for higher-priced single family homes. Meanwhile, prices in Eastern Ontario, Quebec, New Brunswick, Nova Scotia and Prince Edward Island have been rising following years of steadily firming market conditions. By contrast, prices were more or less flat or eased slightly in the natural resource-intensive provinces of Alberta, Saskatchewan and Newfoundland and Labrador. In 2018, national sales are forecast to number 486,600 units, a decline of 5.3% or 27,000 fewer transactions versus 2017. This is a downward revision of about 8,500 sales from CREA’s previous forecast. The overwhelming majority of the forecast decline in sales next year reflects an expected decline in Ontario sales, with activity anticipated to remain well below the record-levels logged in early 2017. Indeed, new mortgage rules are expected to lower 2018 sales in all provinces except Quebec and Newfoundland and Labrador. Based on research by Altus Group, the forecast annual decline of more than 27,000 sales from 2017 to 2018 translates into a decrease of $1.1 billion in economic activity and nearly 12,000 fewer jobs. The national average price is forecast to edge down by 1.4% to $503,100 in 2018, in large part due to a record number of higher-priced home sales in and around Toronto in early 2017 that is not expected to be repeated in 2018. New mortgage rules and further interest rate increases are expected to further hold sales in check in Greater Vancouver and Greater Toronto. As a result, the average price is forecast to hold steady in British Columbia in 2018, while declining by 2.2% in Ontario. In an extension of current trends, average prices in 2018 are forecast to rise in Quebec, New Brunswick and Nova Scotia. However, price gains in 2018 will be restrained by in all markets by tougher mortgage qualification criteria for low-ratio mortgages that will weigh on higher-end home sales activity. Also in line with 2017 trends, average prices in Alberta, Saskatchewan and Newfoundland and Labrador are forecast to either hold steady or edge back slightly in 2018. The Canadian Real Estate Association (CREA) is one of Canada’s largest single-industry trade associations, representing more than 120,000 real estate Brokers/agents and salespeople working through more than 90 real estate Boards and Associations. Ottawa, ON, November 15, 2017 – According to statistics released today by The Canadian Real Estate Association (CREA), national home sales posted a modest monthly increase in October but remain below levels recorded one year ago. National home sales rose 0.9% from September to October. Actual (not seasonally adjusted) activity stood 4.3% below last October’s level. The number of newly listed homes edged back by 0.8% from September to October. The MLS® Home Price Index (HPI) was up 9.7% year-over-year (y-o-y) in October 2017. The national average sale price climbed by 5% y-o-y in October. Activity in October was up from the previous month in about half of all local markets, led by the Greater Toronto Area (GTA) and the Fraser Valley, together with a number of housing markets in the Greater Golden Horseshoe region. Actual (not seasonally adjusted) activity was down 4.3% in October 2017, extending year-over-year declines to seven consecutive months. Sales were down from year-ago levels in slightly more than half of all local markets, led overwhelmingly by the GTA and nearby cities. The number of newly listed homes eased by 0.8% in October following a jump of more than 5% in September. The national result was influenced most by declines in new supply in London-St. Thomas, Calgary and Greater Vancouver. With sales up slightly and new listings having eased, the national sales-to-new listings ratio rose to 56.7% in October from 55.7% in September. A national sales-to-new listings ratio of between 40% and 60% is generally consistent with a balanced national housing market, with readings below and above this range indicating buyers’ and sellers’ markets respectively. That said, this rule of thumb varies among local markets. Considering the degree and duration that current market balance is above or below its long-term average is a more sophisticated way of gauging whether local housing market conditions favour buyers or sellers. (Market balance measures that are within one standard deviation of the long-term average are generally consistent with balanced market conditions). Based on a comparison of the sales-to-new listings ratio with its long-term average, about 60% of all local markets were in balanced market territory in October 2017. There were 5 months of inventory on a national basis at the end of October 2017, unchanged from the previous 2 months and almost on par with the long-term average. At 2.5 months, the number of months of inventory in the Greater Golden Horseshoe region is up sharply from the all-time low of 0.8 months reached in February and March. However, it remains below the region’s long-term average of 3.1 months. The deceleration in price gains largely reflects softening price trends in Greater Golden Horseshoe housing markets tracked by the index. The y-o-y increase in the national single-family benchmark home price diminished further, continuing the trend in place since May 2017 and making it the smallest y-o-y increase since March 2015. Apartment units again posted the largest y-o-y gains in October (+19.7%), followed by townhouse/row units (+13.2%), one-storey single family homes (+6.3%), and two-storey single family homes (+5.8%). After having dipped in the second half of last year, benchmark home prices in the Lower Mainland of British Columbia have recovered and now stand at new highs (Greater Vancouver: +12.4% y-o-y; Fraser Valley: +17.3% y-o-y). Benchmark home price increases have slowed to about 14% on a y-o-y basis in Victoria, while still running at about 19% elsewhere on Vancouver Island. Price gains slowed further on a y-o-y basis in Greater Toronto, Oakville-Milton and Guelph; however, prices in those markets remain well above year-ago levels (Greater Toronto: +9.7% y-o-y; Oakville-Milton: +8.3% y-o-y; Guelph: +13.2% y-o-y). Calgary benchmark prices remained just inside positive territory on a y-o-y basis in October (+0.3%), while prices in Regina and Saskatoon were down compared to last October (-1.7% y-o-y and -4.1% y-o-y, respectively). (Due to a technical issue, MLS® HPI data for Regina and Saskatoon were recalculated from July 2017 onward). Benchmark home price growth accelerated in Ottawa (+6.6% y-o-y overall, led by a 7.2% increase in two-storey single family home prices), Greater Montreal (+5.7% y-o-y overall, led by a 7.7% increase in prices for townhouse/row units), and Greater Moncton (+5.9% y-o-y overall, led by an 8.8% increase in one-storey single family home prices). Ottawa and Greater Montreal recorded their biggest y-o-y price gains since October 2010 and April 2011, respectively. The actual (not seasonally adjusted) national average price for homes sold in October 2017 was just under $506,000, up 5% from one year earlier. The national average price is heavily skewed by sales in Greater Vancouver and Greater Toronto, two of Canada’s most active and expensive markets. Excluding these two markets from calculations trims more than $120,000 from the national average price (to just above $383,000). Ottawa, ON (October 27, 2017) – The Canadian Real Estate Association (CREA) today announced that Michael Bourque has accepted the role of Chief Executive Officer (CEO), effective later this year. Mr. Bourque is currently the CEO at the Railway Association of Canada. He has 30 years of experience in public policy roles on Parliament Hill, as a senior federal public servant and in government relations for Bayer and the Chemistry Industry Association. Mr. Bourque will replace Gary Simonsen, who will retire at the end of the year, after 20 years at CREA, most recently as CEO and formerly as COO. Michael Bourque was the President and CEO of the Railway Association of Canada (RAC), a post he held beginning in 2012. The RAC is a trade association representing over 50 railways and more than 33,000 employees from coast to coast, as well and over 75 supplier companies who build and maintain railway equipment. Michael has served as the Chair of the Transportation Roundtable, and was a Board member of Operation Lifesaver. Michael has some 30 years of experience in public policy roles on Parliament Hill, as a senior federal public servant and in government relations for Bayer and the Chemistry Industry Association. He is a graduate of Toronto’s York University, where he studied Public Administration and Economics. Ottawa, ON, October 13, 2017 – According to statistics released today by The Canadian Real Estate Association (CREA), national home sales in September rose modestly from the previous month but remained down from levels recorded one year ago. National home sales rose 2.1% from August to September. Actual (not seasonally adjusted) activity stood 11% below last September’s level. The number of newly listed homes rebounded by 4.9% from August to September. The MLS® Home Price Index (HPI) was up 10.7% year-over-year (y-o-y) in September 2017. The national average sale price climbed by 2.8% y-o-y in September. The number of homes sold via Canadian MLS® Systems edged up 2.1% in September 2017. The small gain builds on an even smaller increase in August, but leaves national home sales almost 12% below the record set in March. Activity was up between August and September in about half of all local markets, led by Greater Vancouver and Vancouver Island, the Greater Toronto Area (GTA), London and St. Thomas, and Barrie. In and around the Greater Golden Horseshoe region, some markets posted monthly sales gains while activity in others remained near recent lows or fell further. Actual (not seasonally adjusted) activity was down 11% in September 2017 compared to the record for the month in 2016. Sales were down from year-ago levels in close to three-quarters of all local markets, led by the GTA and nearby housing markets. The number of newly listed homes rebounded by almost 5% in September following three consecutive monthly declines. The national result was largely the result of a jump in new supply in the GTA. With new listings up by more than sales in September, the national sales-to-new listings ratio eased to 55.7% compared to 57.2% in August. A national sales-to-new listings ratio of between 40% and 60% is generally consistent with balanced national housing market, with readings below and above this range indicating buyers’ and sellers’ markets respectively. Based on a comparison of the sales-to-new listings ratio with its long-term average, about two-thirds of all local markets were in balanced market territory in September 2017. There were 5 months of inventory on a national basis at the end of September 2017, unchanged from August and broadly in line with the long-term average for the measure. At 2.4 months, the number of months of inventory in the Greater Golden Horseshoe region is up sharply from the all-time low of 0.8 months reached in February and March. However, it remains below the region’s long-term average of 3.1 months. The Aggregate Composite MLS® HPI rose by 10.7% y-o-y in September 2017, representing a further deceleration in y-o-y gains since April. Price gains diminished in September among the ground-level benchmark homes tracked by the index and accelerated slightly for apartment units. Apartment units again posted the largest y-o-y gains in September (+19.8%), followed by townhouse/row units (+13.5%), one-storey single family homes (+7.9%), and two-storey single family homes (+7.2%). While price trends continue to vary widely by region, benchmark home prices were up from year-ago levels in all 13 markets tracked by the MLS® HPI – something that has not happened in close to seven years. After having dipped in the second half of last year, benchmark home prices in the Lower Mainland of British Columbia have recovered and now stand at new highs (Greater Vancouver: +10.9% y-o-y; Fraser Valley: +16.2% y-o-y). Benchmark home price increases have slowed to about 15% on a y-o-y basis in Victoria, while still running at about 20% elsewhere on Vancouver Island. Price gains slowed further on a y-o-y basis in Greater Toronto, Oakville-Milton and Guelph; however, prices in those markets remain well above year-ago levels (Greater Toronto: +12.2% y-o-y; Oakville-Milton: +8.8% y-o-y; Guelph: +17.3% y-o-y). Calgary benchmark prices remained just inside positive territory on a y-o-y basis in September (+0.6%). Meanwhile, home prices accelerated on a y-o-y basis in Regina (+7.7% y-o-y) and turned positive in Saskatoon, posting their first y-o-y gain since mid-2015. Benchmark home price growth accelerated in Ottawa (+6.2% y-o-y overall, led by a 7.2% increase in one-storey single family home prices), Greater Montreal (+5.1% y-o-y overall, led by an 8.3% increase in prices for townhouse/row units), and Greater Moncton (+5.4% y-o-y overall, led by a 7.2% increase in one-storey single family home prices). For Ottawa and Greater Montreal, the September 2017 y-o-y price gains were the largest since November 2010 and May 2011 respectively. The actual (not seasonally adjusted) national average price for homes sold in September 2017 was just over $487,000, up almost 3% from one year ago. The national average price is heavily skewed by sales in Greater Vancouver and Greater Toronto, two of Canada’s most active and expensive markets. Excluding these two markets from calculations trims more than $110,000 from the national average price (to just above $374,500).